A while back I discovered the amazing power of a little Sunday night planning session and have been in love ever since. Spending some time on Sunday night to prepare for the week and specifically for Monday morning is an awesome productivity tool. It helps me hit the ground running on a Monday morning as I look around and see people struggling to find their first cup of coffee (one reason why I try to work out as soon as I wake up). I look at these last two weeks as the Final Sunday of the year. Unless you work in a tax department or a sales position where you haven’t hit your numbers yet, not a whole lot of meaningful work is accomplished during this time. People are vacationing, checked out, shopping, in family mood, in vacation mode, whatever. So while I’ve given up on trying to meet and contact people over the next two weeks, I fully intend to do some super planning sessions to ensure that I hit the ground running in the new year. I’ve mentally transformed these last two weeks into one Big Final Sunday. All things considered, I had a very productive night. Got a lot of work things done, caught up on some internet reading, had successful Twitter conversations and started teaching myself how to play the piano again (haven’t played in 15+ years but off to a great start). 2:15 AM came and went. I finally decided to call it quits at 3, and a funny thing happened. Instead of my normal, I’m sleeping in 3.8 seconds after hitting my pillow, I think I was still awake after laying down for 10 minutes or so. Practically a new world record for me. 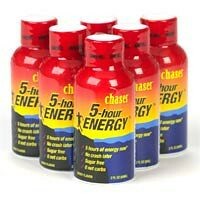 Now, I am not naive enough to say 5 Hour Energy is the greatest thing ever. I actually question whether similar results could have been accomplished by drinking a 5 Hour Energy bottle filled with water (Space Jam style). And not falling asleep right away can easily be attributed to the fact that I am very excited about the things I am working on.